There has always been something about Southern Queensland that has strongly appealed to me for the longest time. Its certainly not the beer, being a Toohey's Old drinker from birth, XXXX of any description, Gold, or otherwise just does not do it for me, except perhaps to cross out an incorrect word. Yet again, the stalwarts of the legendary UNEMCC gathered together and went where the road beckons, as you do. 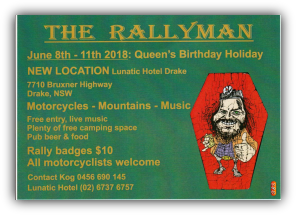 The rough plan was to head northwards through some semi-familiar country stopping night #1 at Killarney, where we would all meet, and night #2 in Nobby, riding through 'who knows where, but not in a direct line, to Nobby'. A good and gentlemanly plan. The plan was to arrive at Killarney late-ish arvo (never a good idea to get to the pub early... Ugh, I hate getting up close and personal with the floorboards before dusk). I rode north to Woodburn (ugh... the Pacific roadwork) and left onto the Casino-Woodurn Road, via Coraki, right a Casino, through Kyogle (suggest you fill up there, especially if you need 98 petrol, as there little of that fuel in the small towns in Southern Queensland), and met up with Kog at Wiangaree (pronounced Why-angry... Love it). Its a very small town with a great general store selling all the normal stuff, as well as great coffee. Say hi to Trish, she will look after you. 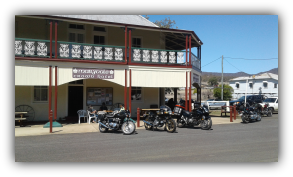 We then headed north to Woodenbong, then to Killarney. The road north west from Woodenbong, is all tared. That's about the only positive thing I can say about it. A very ordinary surface and we did it in drizzle, wet road all the way, but its by far the shortest route from 'a to b', just take it easy and enjoy the scenery... it's definately not Eastern Creek. It was a very easy day at only 250kms. We stayed the night at the Killarney Hotel. It's your classic old hotel, $55 a night including a continental breakfast. 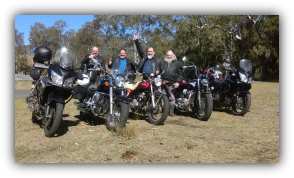 The rest of the group joined us there, John and Greg from Brisbane and Bill from Castlemaine Vic... A very big ride. The Rallyman Rally @ the Lunatic Hotel, 2018 was a hoot. Only about 200ish people there, as its the first time at this venue, but great! The band Sabotage blew us all away. Onya Kog, a great event. It was very civilised. The first time I have seen a baby at a motorcycle rally. • Have good quality bedding and room facilities. Yes, typical of an old pub. • Have a licence to sell alcohol. Of course it's a pub. • Weblink for info. No direct link. The next day some needed fuel, and there is not a lot of it about, so again I suggest you top up in a major centre the day before. We headed from Killarney east and north east to Mount Alford. This is called ' The Falls Drive' and its gorgeous. Take it easy, it is tight and slow, but wonderful. The pic to the right is the boys in a valley in the falls drive. Morning tea at Mount Alford, then onto Maryvale and the Crown Hotel for lunch. There are new owners at the Crown and the meals are great. Mick and Annie will look after you there. They also have refurbished ensuite accommodation upstairs starting at $75 a night, including breaky. It's a top pub. 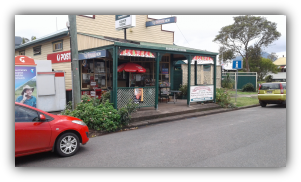 We dragged ourselves away from the Crown Hotel and headed to Nobby, via the backroads. 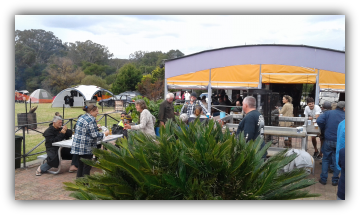 It's lovely open country, and just after some rain it was beginning to green up, arriving at Rudd's Pub mid arvo. There's not much at Nobby, and there is zero fuel. Rudd's Pub is named after Steel Rudd of Dad and Dave fame. Steele Rudd lived in the area and apparently wrote some of his works at the pub. Again, the pub is under new management and has been refurbished. The rooms are $120 for single ensuite room with a cooked country breakfast. Gayle is the cook and her meals are simply to die for. Evan looks after the bar, and for my money, the beer and the rooms are a bit on the expensive side. And.. we did not appreciate being asked to retire to our rooms at 9.15pm as Evan wanted to close the bar and go to bed... Wtf!! This is made up partially by the cooked breakfast, which could not be beat.... Onya Gayle! • Have good quality bedding and room facilities. Yes. • Address: 10 Tooth Street, Nobby. 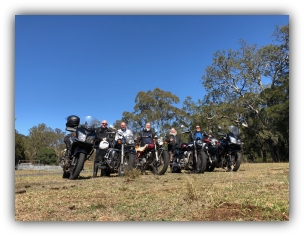 The following day we rode back to Boonah, then parted ways returning home. There is just something about Southern Queensland away from the coast that really attracts me. It's gorgeous country with generally good roads. However, on the way back from Rathdowney through Mount Lindsay, I have to say that the quality of the road on the NSW side, was so so much better than the Queensland side... by a country mile. All in all that whole area is great, and I would ride through it again and again. We made it through The Falls Drive. The Crown Hotel at Maryvale. Loved it.